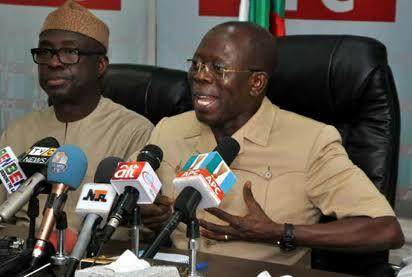 Ogun State Chapter of the All Progressives Congress (APC) on Tuesday night accused National Chairman of the party, Adams Oshiomhole, of being the problem of state chapter in his desperate bid to manipulate the gubernatorial primary in favour of a particular aspirant. In a live broadcast address on Tuesday in Abeokuta, the Ogun State capital, the Secretary to the State Government, Taiwo Adeoluwa, said Oshiomole is acting a carefully written script about Ogun ostensibly to reach an outcome that would be against the choice of the party. Adeoluwa however called on President Muhammadu Buhari and other well meaning leaders of the party to prevail on Oshiomole not to set Ogun State on fire in desperation to return unnamed aspirant as party’s governorship flagbearer in the state. He said the APC in the state would not participate in any further primary until the NWC writes a letter indicating a definite date and an agreement on the mode of the primary. He said: “We have learnt on good authority that the national headquarters of APC is determined and desperate to force a particular candidate on the people of Ogun state, we will be ready for them and we shall do nothing unlawful. “We have decided and that is what the leaders have asked me to tell the whole world that, In Ogun state we shall not participate in any primary unless and until the National Working Committee will specifically write to us on a date that will not shift and agree on the mode of primary. “We decline ballot paper because that is not their own guidelines. We can not smuggle into Ogun state, what has not been practised elsewhere. We don’t know why they are desperate to disturb the peace of Ogun state.